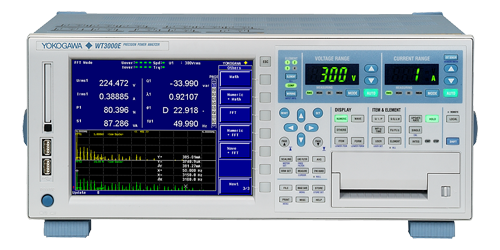 The WT3000E can perform measurements on up to 4 power input elements in a single unit. This enables users to simultaneously measure single-phase input/three-phase output, or three-phase input/three-phase output. Motor drive technology has become more complex in recent years; pure sine-wave PWM is less common, and cases in which the mean voltage differs greatly from the fundamental voltage waveform are more frequent. With the harmonic measurement option in the WT3000E, accurate measurements of commonly measured values such as active power and the fundamental or harmonic components can be taken simultaneously without changing the measurement mode. High frequency bandwidth is very important in order to measure PWM voltage and its active power correctly. With a broadband capability from DC to 1MHz, the WT3000E enables users to capture distorted waveforms accurately. With the delta computation function, the device under test without a neutral line can be measured in a three-phase threewire (3V3A) configuration, which enables each phase voltage to be calculated. The fundamental frequencies of motors have become higher. The WT3000E allows harmonic measurements of signals with fundamental frequencies as high as 2.6 kHz. Torque speed can be evaluated based on the torque and revolution speed data measured with the motor evaluation function. Also, the WT3000E enables users to verify the cycle-bycycle voltage, current, and power fluctuations that occur during the start of a motor. High-precision, simultaneous measurements are required in measuring conversion efficiency of a converter while it converts three-phase input to a DC bus, and from an inverter's DC bus to three-phase output. For measurements exceeding 30 A input, 2 A input elements can be used along with an AC/DC current sensor. When measuring three-phase input/three-phase output with a three-phase four-wire system, the input and output can be measured simultaneously by synchronizing two WT3000E units.